At The Good Wardrobe we aim to tell you about the best brands, websites, products and services that are committed to a more conscious approach to fashion. These days there are many online retailers offering ‘ethical’ or ‘sustainable’ fashion, but not all quite hit the mark when it comes to quality and aesthetics. One new womenswear eCommerce site that most certainly does cut it in the style stakes is the relative newcomer Gather& See. Launched this Spring by co-founders Alicia Taylor and Stephanie Hogg, Gather&See have a philosophy that we admire and share - it is one of ‘showcasing designers that pride themselves on aesthetics as much as their ethics’. They curate their collections according to certain criteria and each garment selected must adhere to at least one of the following: Organic, Fair Trade, Recycled, Eco Friendly, Hand Crafted or Small Scale Production. Visitors to the website can shop according to these ‘six founding principals’ and find out the story behind the garment and the ethics behind the brand. Designers selected for the forthcoming AW14/15 collection include established brands such as Beaumont Organic, Goodone and H Fredriksson, as well as emerging designer Flavia La Rocca who we featured in our London Fashion Week AW14 coverage in February. For now though, whilst we anticipate the Autumn selection, much of the current SS14 collection is on sale and, with up to 75% off, there are some brilliant bargains to be had. It's also worth noting that a number of the designers – Anne Gorke (top), Curlee Bikini, CUS, Feral Childe, Osei Duro (second from top) and Upstate (above) - are exclusive to Gather&See in the UK, so you won't find them anywhere else on these shores. Whilst we naturally don't advocate splurging in the sales just for the sake of bagging a bargain, we’ve spotted some classic pieces which could be worn year-round including Kowtow's organic and Fairtrade Building Block Cami Top for £17 down from £35, Anne Gorke's Parka Jacket (top) for £255 down from £585, Nobody Skinny Jeans (below), and NearFar's MurrayTown Trousers and Tombo Jacket (above). Plus, if you are yet to take your summer holiday there are gorgeous garments and accessories which, if chosen carefully, could complete your 2014 summer capsule wardrobe and be an investment for the coming years. 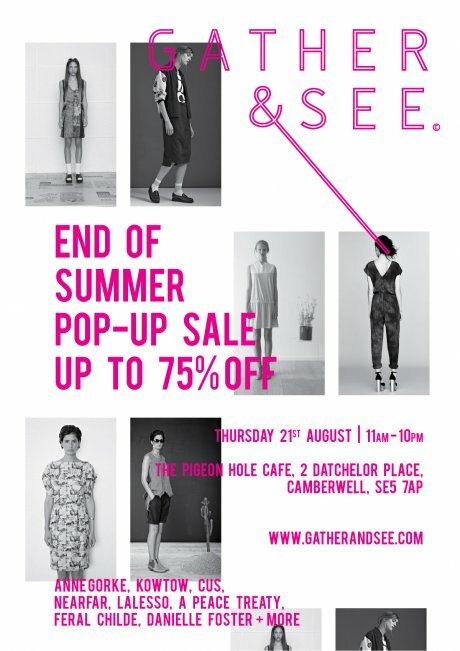 If you are within easy reach of London, you may want to get along to Gather&See's end of summer pop-up shop in Camberwell this Thursday 21st August, where they will be offering their SS14 sale stock – full details below. If you can’t make it along then you need not feel left out as you can order direct from the website and take advantage of their international delivery.